Newfoundlands are giant breeds and have specific nutritional requirement they need to help maintain overall health. Having the right dog food can provide your Newfoundland with proper nutrition without risking the extra weight that comes along with empty calories. Newfoundlands are gentle giants. They resemble bears or at least a mythical creature of yore and cause quite a stir everywhere they go. They’re considered to be one of the most intelligent dog breeds you could have and need support for both mental agility and their massive frames. Let’s find out how you can best support your beast, ahem, dog, so that you can enjoy that sweet face from puppyhood all the way to twilight years. Giant breeds are prone to musculoskeletal issues including joint pain and problems with the back and spine. It’s critical to give them dense nutritional support for muscles and enough calories to maintain energy without adding empty fillers that can cause weight issues. Because they’ve got so much hair, supporting skin and coat health is also a must. You may not find skin irritations until it’s a considerable situation because of their fur, so good foods that don’t inflame allergies are also top on the list. You may save money on cheap foods, but you’ll likely shell out a lot more in vet visits as your pet’s health declines. Giant breeds have specific health conditions you should watch out for, but Newfoundlands also have some specific health concerns that could cause issues in life if not cared for. Heading these off before they’re a problem helps keep your Newfoundland in top shape. Genetics plays a huge factor in this condition, but that doesn’t mean you can’t support joint health. Your pet might be born with a defect in the hip sockets, but making sure to maintain a healthy weight and feeding foods with glucosamine and chondroitin can keep the joint from breaking down early. Large dogs are at risk of a serious condition called Bloat in which the stomach fills with air and twists. We aren’t sure what triggers this condition, but it’s fatal if left untreated. What we do know is that feeding foods of dense nutrition in smaller quantities may help keep bloat at bay and probiotics help with digestive issues across the board. Controlling weight is critical to a heading off a broad range of health issues for Newfoundlands. They need a lot of energy throughout the day, but that energy needs to be tightly packed into smaller quantities of food to help Newfoundlands, especially seniors, keep at an ideal weight that won’t stress the joints or back or cause skin irritations. Cheap foods are nothing but fillers, and you’ll be hard-pressed to balance your Newfoundland’s nutritional need with these foods. Newfoundlands need premium proteins from whole meat sources (no byproduct meals or soy proteins). This gives their bodies the building blocks for healthy growth and maintains the muscle mass needed to support their massive frames. Balancing this should be complex carbohydrates for all-day energy without empty calories. Look for foods that support joints with glucosamine and chondroitin and that support skin and coat health with essential fatty acids. Whole veggies and fruits should provide vitamins, minerals, and fiber for proper digestion. Probiotics also support digestion as well as the immune system. If your Newfoundland is sensitive to certain ingredients, switching to a limited ingredient diet or a cooked diet could help you avoid those persistent skin irritations. It could also help encourage better digestion for weight loss and better energy throughout the day. Corn and soy are often used to reduce the overall cost of food, but this is a terrible idea. These offer no nutritional support and provide nothing but empty calories that can cause weight gain and trigger allergic responses. By-product meals are also cheap fillers that can cause allergic responses. Plus, they don’t provide quality protein sources that can keep up with your Newfoundland’s nutritional needs. Stick with whole proteins. Artificial colors and flavors are for human benefit and not the dog. They provide the appearance of quality foods, but they often cause digestive issues for sensitive dogs and make it difficult for you to know what’s in your kibble. A new word of warning for some dog foods: potatoes, peas, and legumes have recently been linked to Canine Dilated Cardiomyopathy or an enlarged heart. 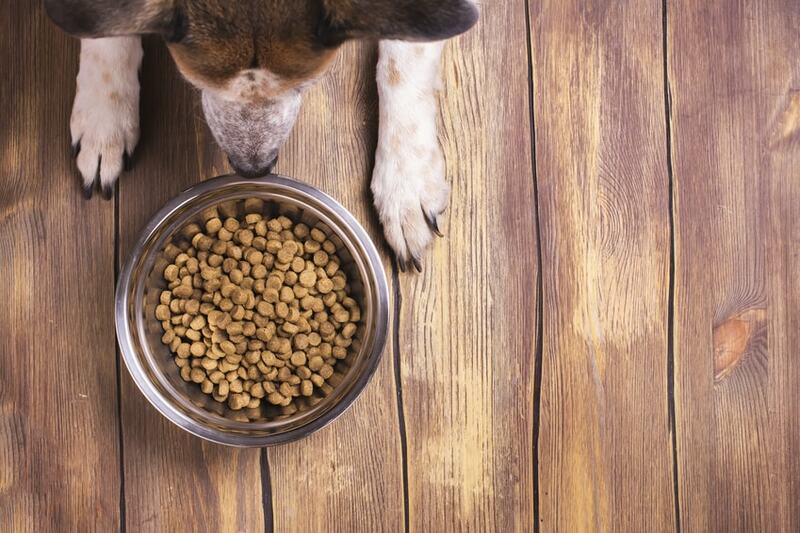 We aren’t sure of the actual link as of yet, but we recommend you avoid these ingredients in the first three listed on your dog food just to be safe. Not to name names, but yes we will. Some of these popular and cheap foods are the worst offenders for adding cheap fillers to your food to bring down cost. While you may save some money in the short term, your Newfoundland is likely to make more trips to the vet later for health issues related to food in the long term. Purina Beneful: Uses chicken by-product meals in the first five ingredients in most of their recipes, plus corn as a filler in most recipes. Ol Roy: Uses both corn and soy as the first two ingredients, plus chicken by-product meals for proteins. It also contains gluten, a possible food allergen, and preservatives suspected to be carcinogenic. Kibbles N Bits: Corn, soy, by product meals, and artificial colors and flavors litter the ingredients list for this famous brand. It’s cheap for a good reason, so stay far away. Before you bring a Newfoundland into your family, you need to know what you’re getting into. Their daily nutrition needs are very high considering they weigh on average 100 to 150 pounds for a healthy adult. That translates to a lot of food, so take a long hard look at your budget and check with your vet for specific feeding requirements. Puppies: It’s vital to control growth for large breed puppies so feeding proper portions of nutrient dense food is critical. Your vet is likely to change portion recommendations quickly within a short time to account for quick maturation. Adults: Adults require around four cups of food per day divided into several meals to reduce the risk of bloat. More active adults will need more to maintain energy levels. Seniors: Weight control is critical here, so your vet may recommend a slightly reduced amount of food to account for inactivity. Work with your vet to find the right balance. Here are our top picks for the best dog food for your gentle giant. They use premium ingredients that control weight without sacrifice the building blocks for health and all consider the unique needs of your giant breed companion. Merrick’s Backcountry Raw recipe uses premium kibble with bits of freeze-dried raw meat for texture and whole protein sources. It blends complex carbohydrates with proper fiber content plus fruits and veggies for complete digestive and immune support and all day energy. Glucosamine and chondroitin support joint health while fatty acids keep skin supple and healthy. Merrick uses its very own test kitchens to create wholesome, nutrient-dense recipes for your Newfoundland, helping your companion stay healthy from puppyhood to the golden years. Whole proteins, quality kibbles, and plenty of supplemental support ensure a well rounded and complete diet you can trust. Blue Buffalo is named in honor of a beloved Airedale Terrier, Blue, that started the company on its path. It strives to provide affordable foods without sacrificing any of the dense nutrition dogs need and without adding cheap fillers or artificial flavors. NomNomNow’s cooked recipes offer you a balance between feeding an often confusing and messy raw food diet and store bought kibble. Tasty Turkey Fare contains just six ingredients starting with whole turkey plus plenty of antioxidants, fiber, and fatty acids to round out a complete, organic, nutrient-dense formula. NomNomNow was created by a veterinarian who wanted to offer pet owners a more natural way to feed their beloved companions human grade meals. The meals are cooked in NomNomNow’s kitchens and mailed directly to you in pre-portioned bags ready for serving or cold storage. It’s the ultimate in premium dog foods. You must control your puppy’s growth to help prevent stressing the skeletal development and causing joint issues. Choose a puppy food formulated for large breed puppies to account for your Newfoundland’s unique needs. Instinct By Nature’s Variety uses freeze dried bits of raw meat to encourage your puppy to eat even if it’s still picky from weaning. Whole proteins and proper carbohydrate balance out your puppy’s nutritional building blocks while carefully controlling weight. DHA plus calcium and phosphorus support mental development and healthy bone structure for your growing giant. Instinct By Nature’s Variety seeks to mimic the ancestral canine diet, providing your large breed puppy with the proper balance of protein and carbs plus vitamins and minerals to grow healthy and strong. The company regularly donates meals to shelters so that each puppy has a chance at a healthier beginning. If your puppy still needs a wet food, Nutro’s large breed formula could be the answer. It provides whole proteins with plenty of fiber and good water content for better digestion. It contains all the building blocks for early health including joint and skin support as well as DHA for excellent brain development. Nutro got its start trying to find quality foods for dogs that mimicked what athletes would need. The owner’s athletic lifestyle determined his dog’s activity levels and so top nutrition was a priority to make sure his sporty companion lived life to the fullest. Seniors need foods that provide dense nutrition while carefully controlling weight. Because your Newfoundland may be less active, you should always watch for signs of weight gain so that you can correct course early before more serious health issues arise. Now Fresh uses high-quality ingredients such as whole meats and New Zealand mussels for natural sources of protein and glucosamine. It targets seniors that need weight control with plenty of proteins and joint support. There are no fillers and no cheap ingredients. Plus, the added prebiotics and probiotics work together to improve digestion, support the immune system, and prevent bloat. Now Fresh has been creating complete nutrition for dogs since 1999. The company uses whole, natural ingredients to supply dogs with dense nutritional value that won’t cause excess weight gain or worsen food allergies. Wellness Complete uses whole proteins and slow release complex carbohydrates to avoid spiking your Newfoundland’s blood sugar and to help with weight control. Green tea extract helps fight free radicals present during aging, and the formula also contains ingredients for joint and skin health. Wellness’s main priority is holistic nutrition, keeping your large breed senior healthy and happy well into the golden years. Each recipe is tested endlessly before its released, so you know it’s the best possible recipe it can be. They also use supplements to support your specific senior’s aging. Your Newfoundland needs the proper nutrition from puppyhood to senior years to prevent common health issues associated with the breed and giant breeds in general. Keeping the right amount of protein with complex carbohydrates helps control your Newfoundland’s weight and keep joints healthy. As your Newfoundland ages, this is especially important because it can be nearly impossible to control weight using cheap foods. Empty fillers provide calories without nutritional benefits, so you’ll end up spending a lot of money at the vet dealing with issues that could have been managed by a proper diet in the first place. Get your Newfoundland on a quality food despite the extra cost and it will pay off in spades in the long run when your gentle giant is happy, healthy, and active.